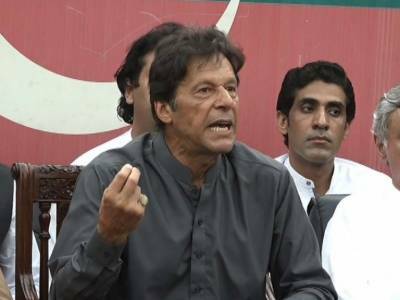 ISLAMABAD: Pakistan Tehreek-e-Insaf (PTI) Chairman Imran Khan on Thursday accused the ruling Sharif family of making desperate attempts to appease Indo-US lobby. In a series of Twitter comments, Imran Khan said that Sharifs and their cronies were desperate to appease Indo-US lobby and interests as their loot/properties are all stashed away in the West. “Their continuous targeting of our armed forces continues today as part of this Indo-US appeasement, he said. Khan said that there was no concern for Pakistani lives sacrificed in the war against terrorism. He said that Khawaja Asif’s remarks in foreign interviews prove that Dawn Leaks was a deliberate attempt by the PMLN to target Pakistani army at a time when it was fighting our enemies on multiple fronts. Khan added that Khawaja Asif’s comments of ownership of militant gaps were coming from a Foreign Minister undermining Pak security. “With such a FM, who needs enemies?,” added.